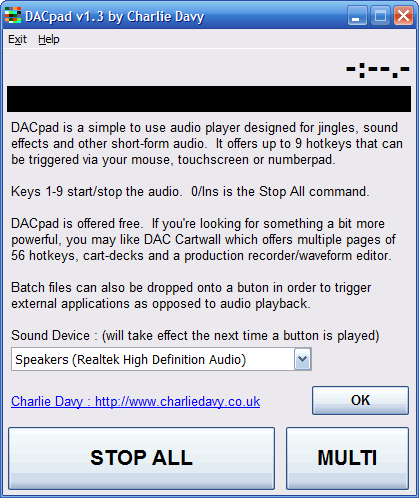 A free and simple application to play in short-form audio clips such as jingles, sound effects and clips – It works great with a USB Numberpad and offers up to 9 hotkey buttons. MP2/MP3/WAV files are dragged from any Explorer window onto a button – just touch to play. 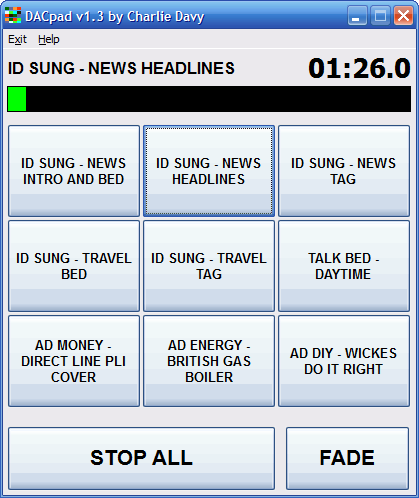 Buttons can overlap and a global “Stop All” button is also provided. Full installation for first-time users – ensure you are logged as Administrator. This is a FREE application and offered “as-is” with no support whatsoever.